Have you ever wanted to travel to the depths of the moon to fight an ancient witch that has possessed technology to rebel against mankind? Well, your oddly specific wish can finally be realized in Xenon Valkyrie+. Like so many Switch indies, this was originally released on Steam, and is now available on the eShop. With so many games making their way to Nintendo’s console on a weekly basis, it can be difficult to know which ones to purchase and which ones to pass up. In this instance it’s not cut and dry and I can’t fully recommend it to just anyone, but a segment of the gaming populace will surely enjoy what’s here. The controls are as responsive as you would hope from an action-platformer. The two main weapons at your disposal are a sword and a gun, both of which have many different versions to unlock as you play. There are three playable characters to choose from, each with their own quirks that make them stand out from one another. The game also features some light RPG elements, allowing you to level up and raise important stats like maximum HP and ammo. 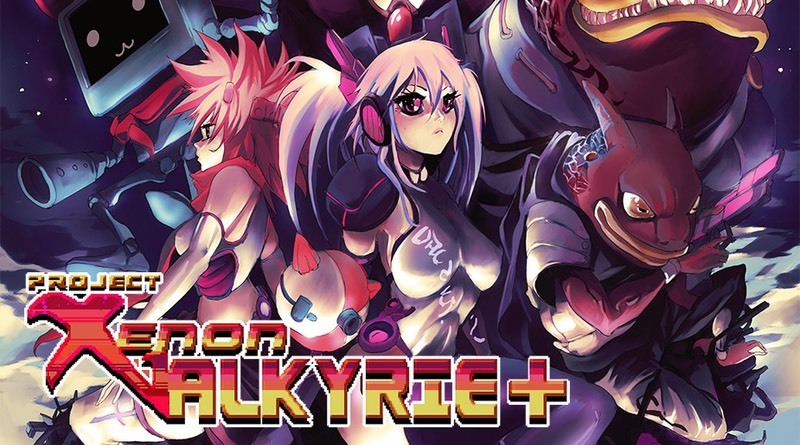 Xenon Valkyrie+ is a Rogue-like, so that means every level is procedurally generated. That’s sort of the genre’s calling card – making no two runs exactly the same. Various games have done this with varying degrees of success. Unfortunately the concept falls short here with uninspired and downright awful level design. The levels are basically a vertical maze where your goal is to reach a teleport pad at the bottom. It seems that no rhyme or reason was given to the design choices and the levels feel extremely boring and sometimes filled with glitched enemies stuck in the walls. You do have an item that you can use to blow up the environment just incase you too get stuck in a wall, but that feels more like an afterthought rather than a fun gameplay mechanic. Other problems abound with this random generator. Every now and then the game even starts the level off by having your character fall directly on top of an enemy or a trap. In a game where every ounce of health is needed to make it to the end, this seems like a cheap trick to stack the deck against you. The very nature of the game encourages exploration in order to find hidden weapons and chests, but the design of the game does it’s best to make it as tedious as possible. All throughout the stages are multiple paths that look like they could hold alternate routes or secrets, but just end up being dead ends. It’s obvious not enough time went into handcrafting the levels and unfortunately that’s one of the game’s biggest downfalls. Despite the poor design choices, the levels themselves do look nice. The game has a cute pixelated aesthetic that really works for it. The stages are decently detailed, even having some beautifully layered backgrounds. The characters and enemy sprites are charming with smooth animation. Old-school gamers are sure to sit up and take notice at the visuals, and they are the highlight of this game. Like most Rogue-likes you can expect it to have a good sense of difficulty. The starting areas aren’t that hard and it’s not until you get to your first boss that the game’s difficulty kicks in. Even with the stat boosts you gain from leveling, managing your health will still remain a top priority. Your gun is quite powerful and an essential asset for keeping the hordes of enemies at a distance. Of course its usefulness is hampered by limited ammunition, so you can’t go too wild shooting the place up. Plus it can’t be used on the bosses, so you’ll have to come up with some new tricks to defeat them. The biggest flaw with Xenon Valkyrie+ is the lack of a fun progression system. All of the truly great Rogue-like games usually feature permadeath. This means when you die you have to start over from the beginning. However, most of them allow for some sort of progression system. Maybe you get to keep your weapons that you discovered, or maybe your experience carries over so you have higher stats to make the next run a little easier than the last. This sense of progression is vital for keeping gamers coming back for more. Here the game only keeps track of your currency, which is used to buy weapons on your next playthrough – but these weapons won’t stay with you once you die. It really makes the RPG elements of applying better stats to your character rather pointless as they reset as soon as you die. While Rogue-likes are designed to be played over and over with each playthrough feeling different than the last, the flaws in this game do quite a bit of damage to its replayability. Both the poor level planning and the non-existent progression system made me tire of the game very quickly. While the game has some other positives, I just didn’t feel like playing this one over and over again – which is essential for a game in this genre. Xenon Valkyrie+ is a bit of a mixed bag. It has plenty of cute visuals and fun gameplay, but it falls short in more important aspects like its level designs and replayability. If you just want some short fun then this would be worth considering. Everyone else should probably pass.